Now is a great time to clean up your planted pots that may be looking a little bedraggled coming off the summer heat. Pansies are a great option to spruce things up, because they will grow and bloom all winter and into spring. Many pansies are bright and bi-colored, making them an eye-catching addition to any garden or pot. Once spring rolls back around, pansies that were planted in fall are usually more robust, having been able to establish strong roots. This plant doesn’t like extreme heat or humidity, which is why they enjoy our fall and spring weather. Pansies are compact and low growing, so they are ideal for edging, borders or container plantings. They grow into clumps as opposed to spreading along the ground, and most varieties will reach a height of 4 – 8 inches. This flower is a great match with spring bulbs. A popular method for mixing pansies with spring-blooming bulbs is to plant bulbs in a garden bed, and then plant pansies right over the bulbs. In the spring, the bulbs will bloom and, as their flowers wilt, the pansies will be beginning their spring bloom. This is an excellent technique to maximize your garden bed color in the spring. Tulips or daffodils are a couple options that look great with pansies. Some cool-season annuals that complement pansies well are snapdragon, calendula, and nemesia. Pansies are fairly easy to grow and will flourish under most conditions as long as they have good soil and at least partial sun. They like steady moisture so don’t let them dry out too much. One of the top reasons pansies fail is not getting enough water, so keep an eye on them and water if you notice they have dried out. 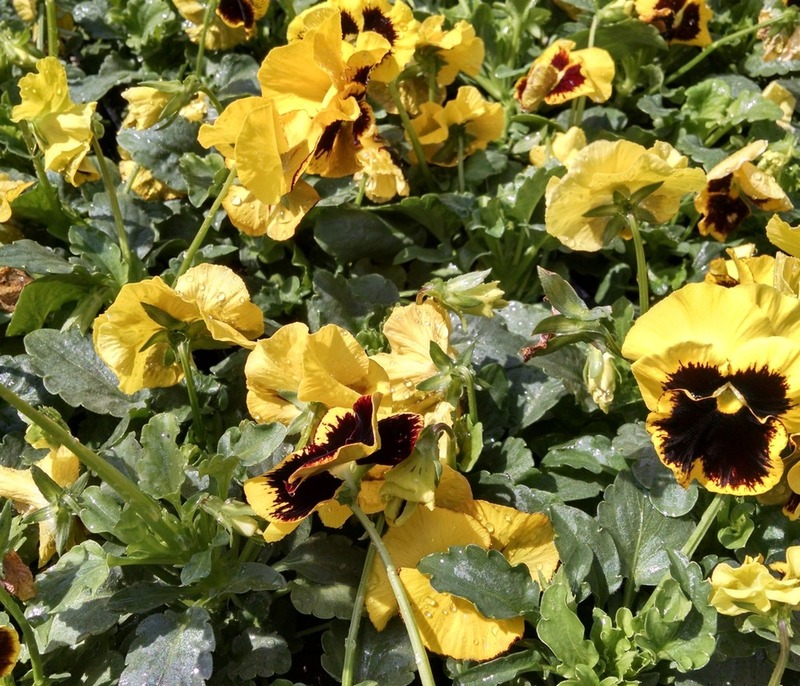 Pansies respond well to deadheading, so keep plucking the wilting flowers off of ‘em. Ensure the plant has adequate nutrition by amending the soil with soil conditioner and Bio-Tone starter fertilizer. A fun fact about the pansy flower: it’s edible! It has a mild, almost minty flavor and tends to be used a lot for decorations and as a garnish. (If you decide to sample some pansies, make sure no pesticides have been used on the plant.) Drop by and see us, we have a fantastic supply of pansies right now that will do a great job of giving your garden or containers a fun pop of color! Hello everyone! Happy Monday! I hope your weeks are off to a wonderful start. I have a few bits of news to share with you today about some of our upcoming events this week down at Garden Supply. I hope you all can join us this Thursday evening for a few fun hours of Wine & Design. Stop in between 6:00pm and 8:00pm and have one of our designers assist you with ideas on plantings for your spring containers. Bring yourself, a group of friends, or put together a little work outing. Wine and light snacks will be served. This event is free but sign-up is requested at (919)460-7747 or info@gardensupplyco.com. And Dad's - Don't forget Mother's Day this year is May 9th. Bring your kids in on Sunday May 2nd between 1 pm - 4 pm and let them plant a summer blooming annual in a pot that they can decorate special, just for Mom. We have so many stunning blooming plants available right now that would make wonderful gifts for that special mother or grandmother in your life. We also have tons of fabulous and gorgeous gift ideas in the Greenhouse. We also offer gift certificates in any dollar amount, and we have free gift wrapping services, as well! Hope you can join us this week down at the garden center. And I'll see you back here soon for more snippets from the garden.